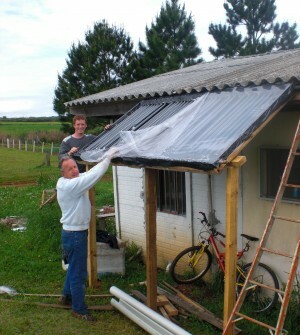 Back in 2009, when my wife and I lived in Brazil, working at a children’s home I set out to make a solar water heater. After some research, I came up with a $300 design that heated about 80 gallons to over 135 degrees. Compared to your average residential water heater, which heats 50 gallons up to about the same temperature and costs a little more to buy has an energy bill on top of it, my design was pretty cheap. 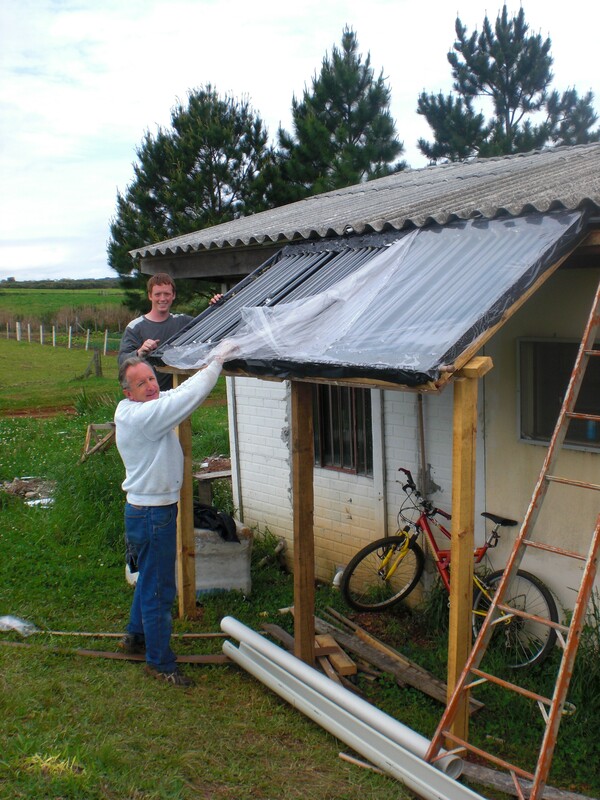 Brazil is a perfect place to use solar heat. 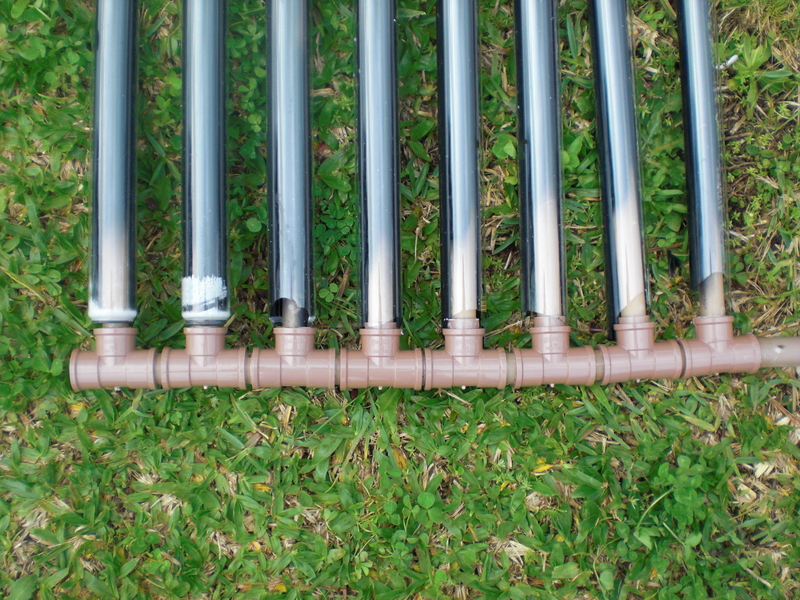 The sun is hot, and the winters are not cold enough to freeze the water in the heater pipes. Also, Brazil relies on instant water heaters for its showers. Each shower head has a 2.5 kw to 7.5 kw heating element in it. Yes, that’s 30+ amps above your head when you shower, but don’t worry, there is a ground wire (but no GFI). Needless to say, you got a little buzz if you put your hand too close to the shower head while it was on… These heaters work great when it comes to solar since you can easily turn them up on cloudy days, or off when it’s sunny out side. 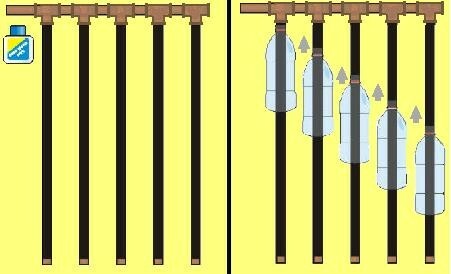 I based my solar water heater on a Brazilian design a friend told me about that used old 2 liter bottles as a glazing of sorts. 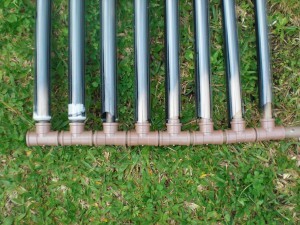 The Brazilian design used a PVC pipe grill with 2 liter bottles fitted over it. Inside the 2 liter bottle was cardboard painted black. This design relied on the “boiler” or hot water storage tank, being above the solar panel. This created a thermosyphon to circulate the water passively. Basically, as the water heated up, it rose. This rising action pulled in cooler water from the bottom of the tank which, in turn, heated and rose up the pipe and back into the “boiler”. 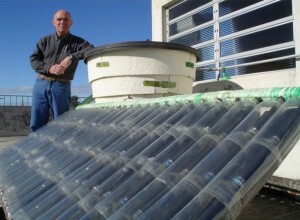 The 2 liter bottles created a green house effect, trapping the heat in near the pipe. I liked this design for its low cost and simplicity. PVC is cheap and easier to work with than copper, there was no circulating pump and it used 2 liter bottles that would otherwise been thrown away. However, the 2 liters were not as transparent as glass and their size limited the amount of pipes in the grill. Also, the design only had one glazing, meaning that as wind blew over the bottles, it cooled the air inside. So I set out to improve on the design. What I came up with was a grill of 32 PVC pipes with old florescent light bulbs as sheaths instead of 2 liters. The light bulbs were made to let light through and their small size allowed me to pack a lot of PVC pipes into my grill. I painted the back side of them black and then used tin foil to seal off the ends. At this point, many people start to talk about mercury poisoning. Don’t worry, water doesn’t circulate through the bulbs, they are just a sheath. Also, I wore gloves and a mask when I cleaned out the poisonous dust from inside the florescent bulbs. 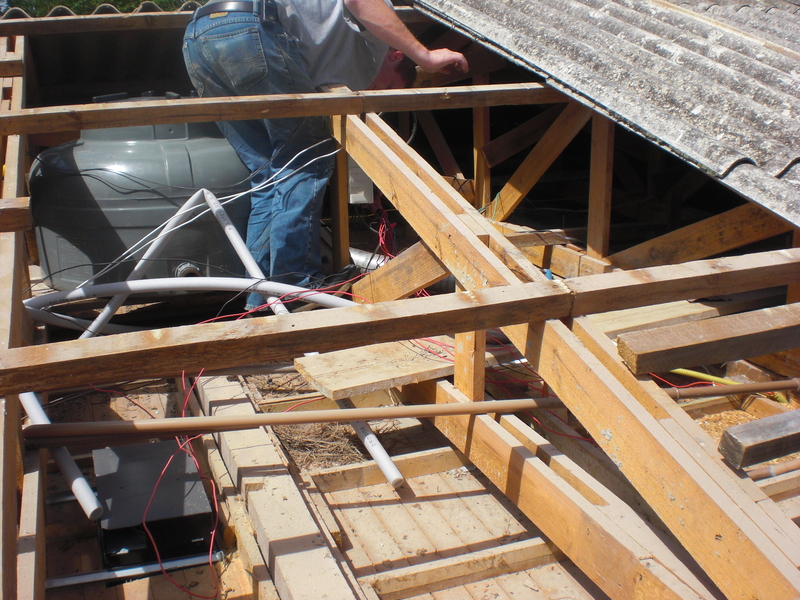 In fact, doing this solar heater project probably improved my health, even with the possible mercury exposure. 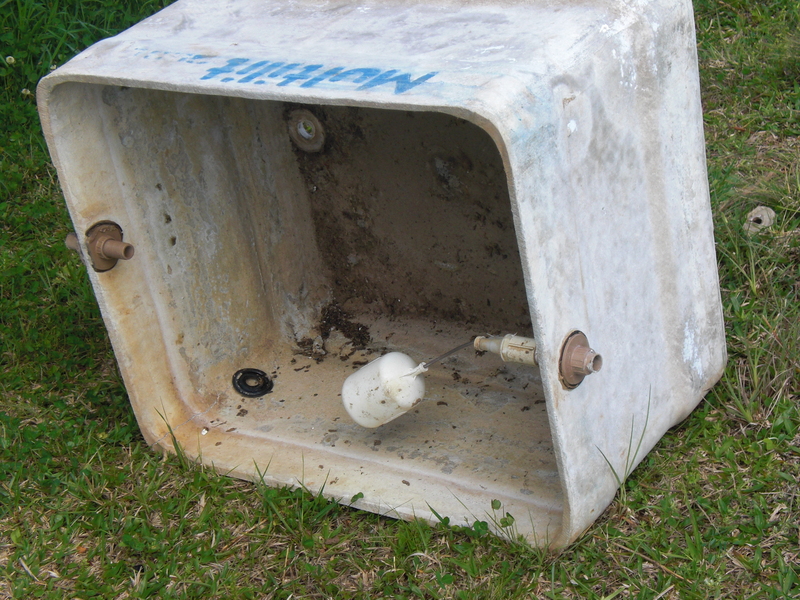 As part of the project I switched out my old water tank (pictured below) for a new one. The significance of this isn’t that the old tank was dirty. No, this was important because my old water tank was asbestos. 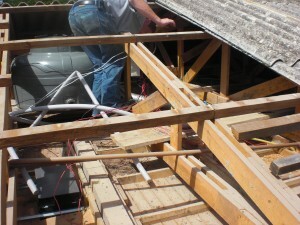 (As was my roof, which you will see in later pictures) So, a little mercury with my asbestos water couldn’t have hurt. Then I put a new water tank in the attic. Being in the attic, the bottom of the tank was higher than the top of the water heater, which is ideal for thermosyphons. Afterwards, I sprayed foam insulation on the tank to keep the water hot. As you can see, my first attempt was to use clear plastic to cover the heater. Within a few hours the plastic was nearly melting from the heat. I later replaced it with glass. The heater worked very well. As I mentioned, it would heat water up to 135 degrees and a little more sometimes. 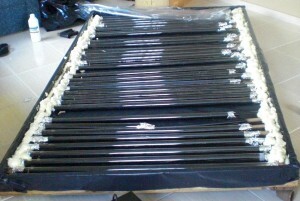 PVC is only rated to 135, so my intention was never to go beyond that. We lived in a colder area of Brazil where it would get down into the upper twenties at night during the coldest part of the year. (Once I slipped on the ice while getting firewood for the wood stove.) But even during the cold times, the water heater was able to warm the water up enough that we only needed to turn our shower head on to low heat. Before, the water wasn’t that warm even on the highest setting. Sadly, a couple of years after I built it I got a call while I was on furlough in the States. My friend told me that our house had caught on fire. The fire ended up melting the water heater’s tank, which in turn, put out the fire. So the solar heater no longer exists. But it was great while it lasted! 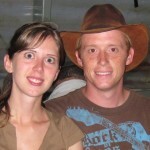 After working for nearly 10 years in Brazil at an orphanage, Jake and his family moved back to the States. Jake enjoys projects that involve Linux as well as writing.